What's New About The Second Edition? First, I rewrote and expanded chapter 1 on Leadership & The Leader to strengthen my explanations about (1) the flawed, vague mental models that most leaders hold (2) the reality of shared leadership (3) the uniqueness of the leader’s role and (4) the fact that there's no one way to lead. Second, I added a new chapter (chapter 2, Applying Leadership’s Four Dimensions) on how to apply the four-dimensional definition of leadership as a practical tool. I wrote this using content developed from coaching sessions. I’ve learned that leadership presence (the subject of the old chapter 5) fascinates readers. In fact, I sense that interest in presence is growing worldwide. So this time around I’ve offered more detail on the seven qualities of presence, giving each quality its own section. I’ve also added self-reflection questions after describing each quality to make the text more personal and useful to you. What’s more, I’ve added a piece on inner division – something I mentioned in the first edition, but didn’t explain. The result is an expanded rewritten chapter (now presented as chapter 6). I felt that I needed to say more about motivation – a subject every leader should understand. So in the chapter on Technical Knowhow there’s a new 15-page section on motivation backed by extensive research notes. It’s material is a bit like Dan Pink’s book “Drive” only slightly more comprehensive … and shorter. It ends with practical advice you won’t find elsewhere. The first edition’s chapter on Technical Knowhow had only a cryptic one-liner on the art of leading change. Change leadership is a subject I’ve been researching since 2012 and I came to feel that what I’d written was inadequate on a topic that all leaders need to grasp. So now there’s a new 25-page section on how to lead organisational change – the toughest of the leadership arts. Based on wide-ranging research, containing ideas known to only a few and closing with my new Spiral-Waves change model, it’s the most practical, compact yet complete material you’ll read anywhere on how to make change happen. As with the Motivation section, it’s backed by extensive research notes for those who want more detail. The last two additions – Motivation and Leading Change – have led me split the old Technical Knowledge & Skills chapter into two: one for knowhow (chapter 7) and the other for skills (chapter 8). I wanted to show how the three levels and four dimensions connect visually to make it easier for readers to see the book’s big picture. This I’ve done in chapter 5, Summarising The Foundations. As I’ve been coaching clients on self-mastery, I’ve tested and added new methods so I’ve updated the section on self-mastery techniques in chapter 11, taking one out and adding one in (the 4R technique). I’ve said a bit more about the distinction between the Fountainhead and Self in the model of the human psyche in chapter 10 as I know this point puzzled some first edition readers. I sharpened my writing to explain every chapter’s key ideas better than before. Thus, no chapter is unchanged from edition one. The graphics have been improved to make the practical exercises stand out more clearly from the tables, diagrams and regular text. Finally, I improved the notes section and index. In expanding certain sections, I’ve not lost sight of my chief aim: to offer you a concise master model for growing yourself as a leader. This meant cutting to the chase and avoiding excess detail. Thus, having explained what I felt would help you most, I’ve pointed you towards other sources where needed. I hope you enjoy the second edition. 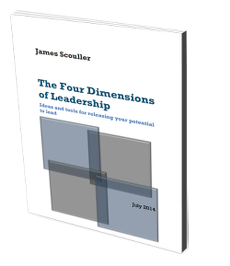 If you click the video on the left, you can see and listen to James Scouller in the first of an eleven-part series of videos on leadership presence. It draws on material from the sixth chapter of The Three Levels of Leadership: How to Develop Your Leadership Presence, Knowhow and Skill (second edition). In the series, James Scouller explains what leadership presence is, compares presence to charisma and describes its seven qualities. 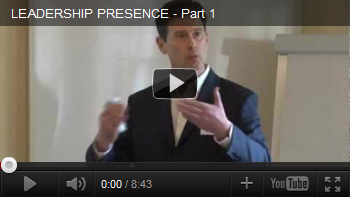 He goes on to outline how you can work on your own leadership presence. Copyright © James Scouller 2011, 2016. Published by Management Books 2000.